SAN DIEGO, Calif. (KGTV) -- Connie Bakken opened her bedroom window Sunday morning and didn't quite believe her eyes. "I called my husband and said, 'Why is the stream purple?" she says. Bakken lives in a Rancho Bernardo home that overlooks a creek just west of Matinal Circle. What she saw - the creek where she loves to watch turtles and crabs live naturally turn into a deep, unnatural purple. "It didn't look like water," Bakken says. "It actually looked like purple paint." Turns out - it very well may have been. About half-a-mile southeast on Poblado Court, a person is suspected of dumping a purple paint-like substance down a storm drain. 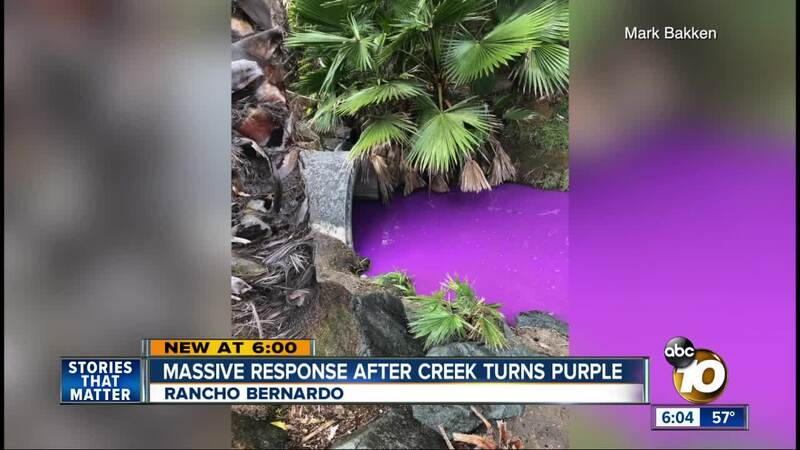 The purple water it created led to a massive city response - Hazmat, Fish and Game, and San Diego Fire-Rescue - all on scene for hours Sunday. Crews ultimately cleaned and flushed 500 feet of pipe to stop the purple contamination from getting to Lake Hodges, one of the region's drinking water sources. "We were able to employ technology allowing field staff to backtrack from the outfall to pinpoint where the discharge originated from and the path it took to reach the outfall," the city said in a statement. On Monday, city code enforcement investigators went door-to-door on Poblado looking for who did it. If ultimately found, that person could face recovery costs and fines of up to $10,000. The city holds hazardous material collection events per year, and residents can visit its hazardous waste transfer facility for no charge. Bakken has a message for the person who dumped the substance. "Please think again before you discard your household supplies," she said. "There's better ways."